Recently, the Lord has been reminding me that I live daily by His grace. Sometimes I feel so weak and so sensible of my many failings daily. I wonder how I can live for God's glory and be more useful in His Kingdom. The Lord brought to my comfort and encouragement, through a devotion by Hoekstra, that it is found on relying upon His grace. I am sometimes preoccupied with my own ability and being sensible of my many weaknesses, I wonder how to live usefully for the Lord. But the focus of the Word of God is on His ability, not ours. I am a weak vessel but in the hands of an Almighty God Who is able to do exceeding abundantly! He Who loves me will keep me and give me the grace to live for Him and in Him daily. "Our God whom we serve is able to deliver us from the burning fiery furnace" (Dan_3:17). "Therefore He is also able to save to the uttermost those who come to God through Him" (Heb_7:25). "Now to Him who is able to keep you from stumbling" (Jud_1:24). " Now to Him who is able to do exceedingly abundantly above all that we ask or think" (Eph_3:20). When we rely upon the one who is able, God, we will experience His sanctifying grace abundantly in our lives. What a comfort and encouragement! Relying upon God Whose love is enduring and Whose mercies are new every morning gives me the courage to face each day, knowing that He is with me, and His grace is sufficient for me. May this article encourage you too. We have seen that abundant grace is available from the Lord, not only for justification, but also for sanctification. Yet, how does a person access the sanctifying grace of God? How does one actually live day by day by grace? Soon, we will consider the two relational realities that God wants to develop in our lives that we might live daily by His grace. First, a reminder of where that grace is, and the ability upon which it all depends. The grace we need is always found in a person, not a procedure. "For you know the grace of our Lord Jesus Christ ." Consequently, in order to access this grace, we must be seeking after the person in whom the grace resides. No wonder that many of the letters of the New Testament end with "The grace of our Lord Jesus Christ be with you all" (Rev_22:21). Our God is not one who wastes words. He does not speak vainly. Nor does He stand on human formalities. These repetitious conclusions are an emphasis from the heart of God. When all is stated on any subject to any people, the ongoing need will ever be that they learn to live by the grace that is found in Jesus Christ. Furthermore, upon whose ability does the grace of God depend? We so easily become preoccupied with our own ability. "Will I be able to please and serve God?" "Will I be able to be an effective witness?" The focus of the word of God is on His ability, not ours. "Our God whom we serve is able to deliver us from the burning fiery furnace" (Dan_3:17). "Therefore He is also able to save to the uttermost those who come to God through Him" (Heb_7:25). "Now to Him who is able to keep you from stumbling" (Jud_1:24). "Now to Him who is able to do exceedingly abundantly above all that we ask or think" (Eph_3:20). 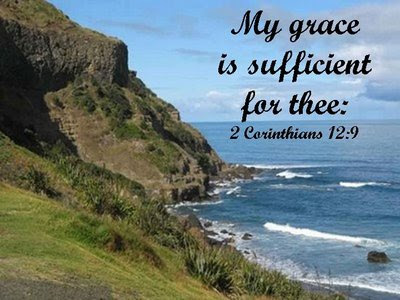 Concerning grace we may even be thinking, "Will I be able to live by God's grace?" Again, God's ability is the issue, not ours. "And God is able to make all grace abound toward you." If we are willing to rely upon the one who is able, God, we will experience His sanctifying grace abundantly in our lives. Dear Lord, Teach me these great matters of access to Your grace. Remind me often that grace is found in Jesus. I confess my tendency to explain the Christian life by a formula, instead of by a person. Help me to remember that living by grace depends upon Your matchless ability. I admit my inclination to hope in my inept ability. So, Lord, I now look to You to abundantly pour out Your grace upon my life, through Christ Jesus, my Lord, Amen. Thanks for stopping by. Take care and have a blessed week. How right you are. Of ourselves we can do nothing but can do all things through Christ who strengthens us.